Venus Viva™ features the DiamondPolar™ applicator for non-invasive face, neck, décolleté and hands treatment. Venus Viva Diamond Polar Skin Tightening is a fast, non-invasive treatment that is very effective in helping to tighten the skin and to reduce the appearance of wrinkles and fine lines on face, neck, décolleté and hands. Venus Diamond Polar™ uses Pulsed Electro Magnetic Fields and Radio Frequency, which give you the added benefits of better oxygen, nutrients, and blood to the skin, giving it an immediate, long-lasting glow along with new healthy collagen production which leads to firm and tighter skin. This is a fast and relaxing arm treatment, and can be done weekly. Venus Viva Diamond Polar Hand Treatment is a skin tightening and rejuvenating treatment for the hands. It reduces the scars and wrinkles on the hands. Venus Viva Diamond Polar Neck Treatment reduce the appearance of saggy skin and help stimulate new collagen generation and elastin fibers. Venus Viva Diamond Polar Décolleté Treatment is a fast, non-invasive treatment that is very effective in helping to tighten the skin, sagging skin areas, loose skin and to firm the décolleté. 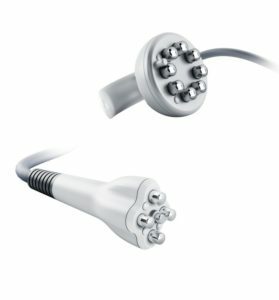 Multi-Polar RF uses a complex algorithm to deliver homogeneous energy and volumetric heating to multiple tissue depths, allowing for quick and safe buildup of heat, and easy maintenance of therapeutic temperature throughout the treatment. 1. What is Venus Diamond Polar Treatment? Troubled by acne scars, fine lines, pigmentation or deep wrinkles? Worry no more, Nulook Beauty and Medi Spa are proud to launch the innovative Venus Viva Diamond Polar Full Face treatment, which uses a unique Diamond Polar applicator to tighten the skin and to reduce the appearance of wrinkles and an increase of oxygen flow to boost the skin for a fuller, more young appearance. 2. Who can go for this treatment? This treatment is suitable for anyone looking to tighten and firm their skin. Venus Viva Diamond Polar Full Face Treatment is the right treatment for you as soon as you are in your 30s. Sagging stage can start anytime after this age and without any further delay, this treatment will be effective to prevent that. 3. How often can this treatment be performed? Venus Viva Diamond Polar Full Face Treatment is really safe and a mild process and can even be done weekly. But we would recommend a monthly timeframe for the treatment.